When it comes to replacing their heating system, many property owners are choosing to ditch traditional financing methods in favour of the ease of a rental agreement. With traditional financing, customers are required to come up with either the entire purchase price or qualify for financing, often requiring a down payment. In addition, those customers need to have additional funds for installation costs and removal of their current unit. Even with a lower cost of living, most struggle coming up with funds for large, often unexpected expenses. Why Air Conditioning & Forced-Air Furnace Rentals? As long as you own your property you are likely to be approved in most cases. Just by placing an easy call to us we can schedule your installation, often as early as the next day. Installation is completely free and we will even include up to 15 feet of venting or duct work. We can even remove your old unit at no cost to you. When you choose a rental agreement, you are choosing to work with the best. We only work with top quality brands like Amana and Goodman, so you don’t have to worry about investing in poor quality equipment. Whether you’re looking for a new propane or natural gas furnace, central air conditioner, ductless mini-split system, or hot water heater, we’ve got it all. Get a free quote and more info, get started in seconds! In addition to a top quality unit, we also include our maintenance and service guarantee. With a rental agreement you are able to schedule annual maintenance visits with our licensed professionals. We will make sure that your system continues to run as efficiently as possible to save you as much as we can on your energy bills. System failure can quickly turn serious in the cold northern winters. With a rental agreement you can avoid wasting your time calling company after company looking for emergency services that won’t break the bank. Our customers are equipped with an emergency line dedicated to them 24 hours a day, seven days a week. You will get expedited service to have your system repaired as soon as possible at absolutely no cost to you. 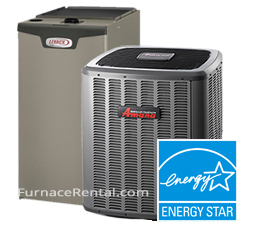 If the occasion arises where we are unable to fix your furnace, we will replace it, completely free. No matter which way you choose to upgrade your system, you will always reap the benefits that come with an energy efficient heating and cooling system. In Ontario you can qualify for up to $650 in government rebates when you upgrade your existing heating and cooling units to energy efficient products. This also applies when you have chosen a rental agreement. We will even apply for you! By investing in your home with a new furnace you are not only increasing the value of your property, but also lowering your environmental impact and saving on your energy bills. It is a win-win situation. Call Today, Have Your New System as Soon as Tomorrow! So why not give us a call to see how we can help you? We never go door to door and we don’t believe in high pressure sales tactics. Our program speaks for itself: low monthly payments, high quality products and lower environmental impact. Call 1-877-785-1055 today to start saving. There are countless reasons that people are drawn to Sudbury to both tour and reside in. From the crisp clean air, wide open spaces and wildlife to the arts, leisure and community spirit-there are many great reasons to love this city. Many make their way to the Northern Lights Boreal Festival where music and fun are intertwined at Sudbury’s Bell Park. Festival goers have the choice of many different kinds of accommodation from camping to hotel. The party often continues downtown in the many clubs. Those looking for family friendly events have lots of choice at the home of the Big Nickel, Dynamic Earth. Featuring both indoor and outdoor exhibits, an underground tour as well as multimedia exhibits. Nominated by attractions Ontario in 2003, Dinosaur Valley Mini Golf is an Inaugural Tourism Federation of Ontario’s Award Winner. Featuring seven unique courses and an over-sized dragon, this attraction is only one of the many reasons so many families choose to call Sudbury home. Another attraction is the low cost of living in northern Ontario when compared with Toronto. Along with the cost of living, temperatures can fall well below zero during the harsh winters. Luckily for residents, high efficiency furnace rentals are available in Sudbury.